There’s just something about eclectic and funky and a little bit off center that really speaks to me. And I’m afraid to ask what that says about me! But it’s certainly why I find projects like this one absolutely irresistible. 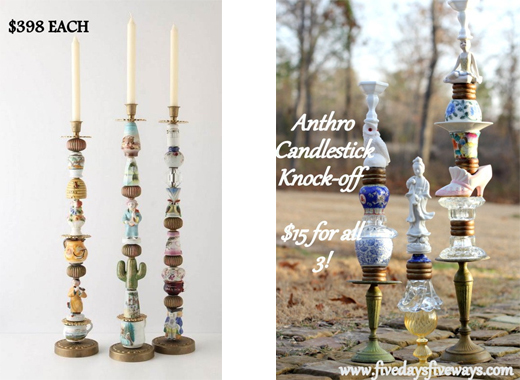 Abbie over at Five Days 5 Ways made her own Anthropologie knock-off candlestick towers. They remind me of the garden towers I’ve been seeing around, and the garden towers I’ve already started for myself. Now I may have to add these candle towers to the list! ok…you've got me thinking…for the longest time I have had these metal candle holders that are flat at the bottom…perfect for the crowning end piece for these creations…and god knows I have plenty of "filler"…thanks for a fantastic inspiration! I agree, the Anthro ones are too 'put together'. I enjoy the knock off much better, plus you can make it theme-ey if you want! Wendy – I totally agree with you. It's the whimsy of the knock-offs that make them so great. I think if you have a wide enough base at the bottom, you'll be okay. So – stack away and try one! And let us know if you do. Aren't they just divine?! I'm gonna start looking around my own stash to see if I can make one. Otherwise…thrift store here I come!